"When Jesus explained the necessity of the new birth, the Jewish leader Nicodemus asked in astonishment, How can these things be? Some two thousand years later, much confusion still surrounds the term born again, though more people than ever claim to have had the experience. In this Crucial Questions booklet, Dr. R.C. Sproul cuts through the confusion and carefully explains what it means, biblically and theologically, to be born again. He affirms, first of all, that Jesus wasnt kiddingnew birth is essentialthen goes on to show what the new birth is and how it occurs. His clear teaching will provide understanding for those who are unfamiliar with the new birth and deeper assurance for those who may not know where they stand with God." 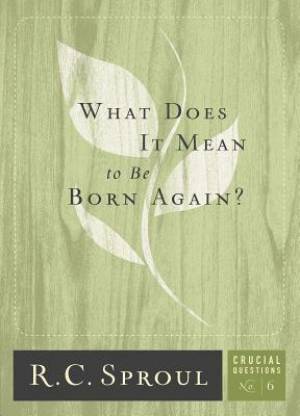 What Does It Mean To Be Born Again by R C Sproul was published by REFORMATION HERITAGE in November 2010 and is our 4415th best seller. The ISBN for What Does It Mean To Be Born Again is 9781567692068. Be the first to review What Does It Mean To Be Born Again! Got a question? No problem! Just click here to ask us about What Does It Mean To Be Born Again.